'Tis the season. Gifts for teachers season, I meant. But it also happens to be the start of hot cocoa season, so I figured I'd combine the two this year. Last year, my sister made vanilla extract for everyone and I plowed through it in no time flat. I decided to try my hand at a homemade gift this year and, while I'm not the best with ribbons and things, I can vouch for the mix inside. I like to add 2 tablespoons of mix to just a bit of hot water to form a paste and then add an additional 6- 8 ounces of hot water or milk. Stir well and enjoy! p.s. - you can use 1/2 cup of whichever sugar you prefer. Great additions include a teaspoon of cinnamon, 1/2 teaspoon of cayenne or 1/4 teaspoon of fresh ground pepper. If you cannot find ground vanilla, no problem. What are your go-to holiday gifts for teachers? The smell of hot cocoa reminds me of coming in from the cold. My mom used to make the most wonderful hot cocoa when I was a kid. I'd spend hours playing outside and come in to find a hot mug waiting for me on the kitchen table. It was never super sweet and while I have always had a sweet tooth, I never cared for sickly sweet beverages. My kids are no different than other kids; they love hot cocoa too. My youngest is dairy free so I bought some coconut milk (unsweetened) so that she can partake in this wintery treat. This morning she tried hot cocoa for the first time and (shocker) loved it! When I told my son that I made the hot cocoa with coconut milk, his first reaction was "eeeeeeew!" But when the moment came for him to drink it, my guy devoured it. I mean, nothing was left over. There was not even a smear of cocoa on the edge of his mouth. Here's the secret: I melted part of a candy cane in the mug. First, we poured 2 cups of unsweetened coconut milk into a saucepan. We put it on the stove on medium high heat. 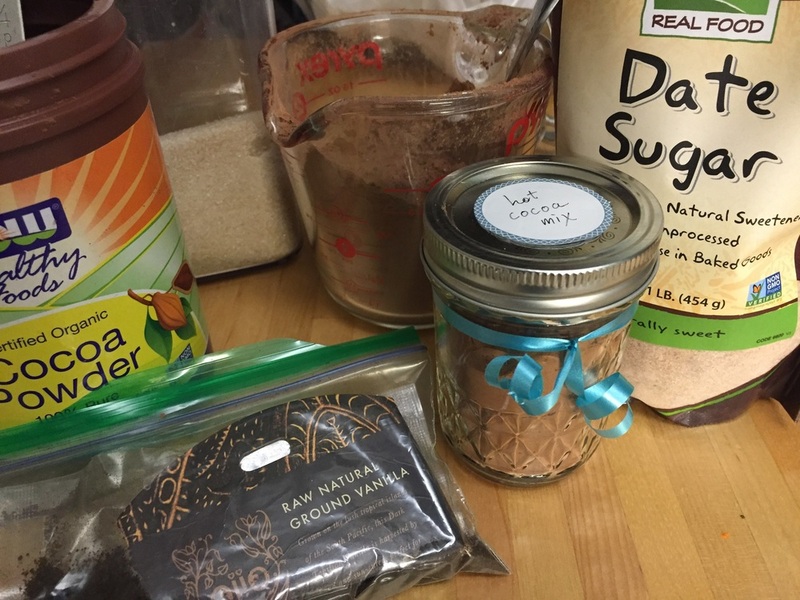 Next, we combined 3 tablespoons of unsweetened cocoa, 1 tablespoon of sugar and 1 teaspoon of cinnamon in a container (I used one with a pouring spout to make my life easier). Next we added 1/2 teaspoon of vanilla extract and about a tablespoon of hot water and stirred until there were very few lumps and it looked like melted chocolate deliciousness. The coconut milk began bubbling and I took it off the heat. I then poured the chocolate mixture into the hot coconut milk and stirred. There will be white clumps - that's okay. I stirred with a whisk and there were still some white clumps of coconut milk skin. When I poured it into mugs, I added a candy cane (somehow we have billions of these in our house) for minty flavor. The kids didn't even make it out of the kitchen with these. It's rich and thick and cocoa-y. Yum yum. Wishing you all a festive holiday season and a happy, healthy new year! I have a sweet tooth. There used to be a time in my life when I ate a lot more candy than I do now (red swedish fish and peppermint patties were some of my favorites). I read this post by Sally of Real Mom Nutrition and like so many of her posts, I felt she was speaking my language. Once I began connecting the dots between how I felt and what I ate, my habits changed and so did my life. I still have a sweet tooth, and while I'll always have a soft spot for homemade chocolate chip cookies, I mainly stick to seriously dark chocolate these days. My kids eat something sweet pretty much every day. I'd love to sit on a high horse and say 'well, it's not junk,' but frankly, I think sugar is sugar. They get heaps of candy for Halloween from trick or treating and eat whatever they want that night. They leave about 10 pieces of candy under their pillow that night for the Candy Fairy, who replaces them with a small toy or book. After that, they can choose one per day until the stash runs out or until the holiday season, when Halloween candy gets dumped out. This year, I've decided to forego buying Halloween candy and will be giving out glow-in-the-dark bracelets and glow in the dark fangs to trick-or-treaters. They're seasonally relevant and they don't contribute to the candy overload of the holiday. They're also safe for kids with allergies, and while I don't have a teal pumpkin, I will print out a photo of one and attach it to our door. What's your Halloween candy strategy? It's that time of year. Cookies, cookies, cookies. We bring them to friends and loved ones, we give them to teachers, we make them for parties. I had never made lace cookies before, frankly because I thought they were complicated but I was wrong! Kind of. The dough setup was easy. It was the baking that threw me for a loop. The first batch that went into the oven completely melted together into one giant cookie sheet-sized lace cookie. My husband laughed, at which point I suggested that he take over the dough assembly portion of the job. He rose to the occasion. His lace cookies were crispy and light, perfectly shaped and sized. In a bowl, combine the flour, oats, brown sugar and salt. Meanwhile, in a small saucepan, melt the butter on low heat. Add the melted butter to the dry ingredients. Add the egg, vanilla, cinnamon and nutmeg and mix thoroughly. Finally, mix in the sesame seeds. Roll the dough into about one inch balls and place on the cookie sheet, making sure to leave enough space between each dough ball. Bake for 5 -7 minutes. Remove them from the parchment paper after they've cooled slightly.